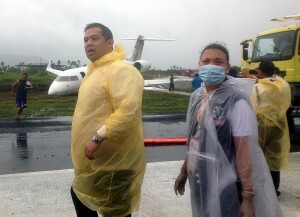 TACLOBAN City – Leyte Rep. Martin Romualdez immediately checked on the condition of President Benigno “Noynoy” Aquino III’s Cabinet members and top officials, all of whom were among the 15 passengers, in addition to Global Express plane crew members, who were aboard the plane that skidded off the wet runway at the Daniel Z. Romualdez Airport in Tacloban City on Saturday. Dr. Wilfredo Liao, director of the Remedios Trinidad Romualdez Medical Foundation, the official hospital during the Pope Francis visit here last Saturday, said the lawmaker asked him to treat the plane’s seven passengers who sustained minor injuries and trauma because of the accident. “It was a good gesture on the part of Congressman Romualdez who arrived first in the scene, knowing he is an opposition leader and a vocal constructive critic of the Aquino government,” Liao said in an interview. “He even visited the patients last night [Saturday] to ensure that all of them are treated well and safe from any danger. All patients were thankful for the treatment and concern extended to them by Congressman Romualdez,” said Liao, adding that six patients were discharged Sunday morning after being confined overnight. Rachel Rodeles-Santiago, chief-of-staff of Romualdez, said Dra. Paula Sydiongco, assistant regional director of the Department of Health, expressed gratitude to the solon for immediately showing up at the scene and alerting the hospital to send ambulances to the airport. Romualdez is among the country’s top opposition leaders who has been consistently receiving criticisms from the President along with his two first cousins, Senator Ferdinand “Bongbong” Marcos and Tacloban City Mayor Alfred Romualdez. Rep. Romualdez was also seen at the airport talking to Executive Sec. Paquito Ochoa and Communications Sec. Herminio Coloma, Jr., two of the five prominent passengers of the plane, to check on their condition. Other top officials in the plane were Malabon City Rep. Josephine Veronique Lacson-Noel, Undersecretary Emmanuel Bautista, and Undersecretary Felizardo Serapio. Rodeles-Santiango said those who were confined at the hospital were pilot Joseph Manigas, co-pilot Vicente Abaygar, Presidential Security Group member Oliver Veslino, flight engineer Rafael Caro, assistant flight engineer Elmer Suba, Julbani Asdani, and Ochoa’s senior staffer Katherine Andraneda. The Bombadier Global Express skidded off the runway of Daniel Z. Romualdez Airport as it attempted to take off Saturday, an hour after the Philippine Airlines plane carrying Pope Francis and his delegation left for Manila. Firetrucks were seen hosing down the downed plane as it lay on the grassy area off the runway.